As smooth as its black exterior, the FRIGIDAIRE FAFW4011LB can deliver vibration-free, noiseless cycles thanks to its Vibration Control system. Being part of the Affinity series of Frigidaire front-loaders, this washing machine makes use of the WashSense technology and trademark TimeWise feature. The result is an energy saving but powerful washing machine that manages to perform well without noise and vibration. The Vibration Control System and Silent Design work together to create a washing machine that is powerful but does not create a disturbance in the laundry room. Even the heaviest loads can benefit from these Affinity series mainstay features, which are readily part of the FRIGIDAIRE FAFW4011LB. Energy Star certified. Not only that, this particular washing machine has other energy saving features and cycles that help in further reducing the energy consumption. So, this washing model is highly recommended to consumers who need extra savings. Highly programmable therefore different consumers can get the right combination of settings to satisfy their clothes washing needs. The settings that they last use will be saved automatically. So the next time that they use the appliance, they can easily use the same settings. There are 7 wash cycles to choose from. 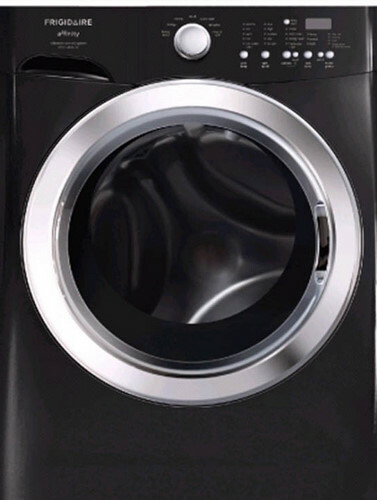 Convenience features are also included in this washing machine model from the Affinity series. One example is the Delay Start, which allows the consumer to program the operation 1 hour to 14 hours prior. Though the classic black exterior of this particular washing machine selection may be attractive, some consumers may be relieved to know that there is another color option – classic white for a more traditional look. 15” pedestal drawer of the same exterior color. Other alternative accessories include a dryer stacking kit and a mobile home installation kit. Comes with the typical Affinity series Stay Put door. This door stays closed even when forced to open, except when the Add a Garment feature is selected. The related Stay Fresh door seal keeps the freshness of the laundry as long as the door is secured. The drum material is made of stainless steel, for rust-free goodness. The FRIGIDAIRE FAFW4011LB operates quietly and with little or no vibration. So, consumers do not have to develop a headache when the load is extra bulky or heavy. Energy Star qualification ensures that the washing machine consumes only energy that is necessary for operation. Still, performance is excellent. The TimeWise feature also contributes to the saving of energy because the length of operation is reduced. Express Select controls provide ease of use. There are 5 cycle status lights available. The parts and materials are sturdy and built to last. The FRIGIDAIRE FAFW4011LB is highly affordable for a washing machine of its kind, at a little over $600. Steam wash is not included.